I said, “Charlie, you’ll have to worsen your eating habits to meet these goals.” He eats NO red meat and next-to-none of any kind. The hospital, in spite of being told he was almost entirely vegetarian, ate no red meat, and had just had his gallbladder removed, brought him meat at every meal but breakfast, beef half the time. Yeah, that’s what I said. 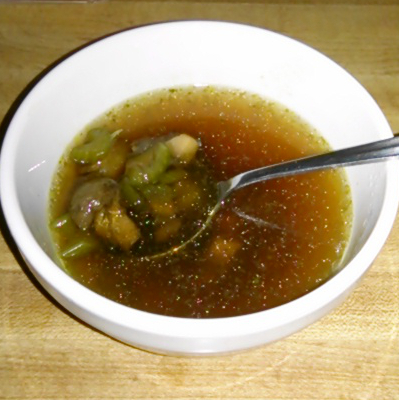 Clear soup of white, portabella, and reconstituted morel mushrooms, celery, and veg broth. Fruit salad! 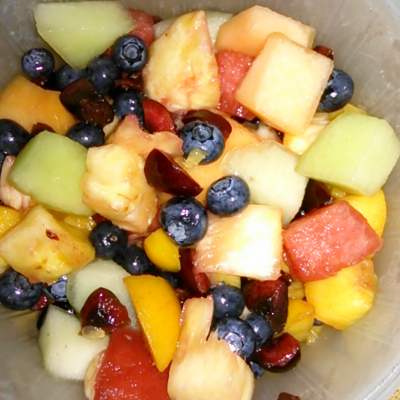 Cantaloupe, honeydew, pineapple, watermelon, blueberries, bing cherries, and peaches. I also made him a smoothie of banana, peanut butter, coconut soy cream, and almond milk. Special diet, schmecial diet. Good food. A WRITING PROMPT FOR YOU: A character has a special request repeatedly ignored. Is it trivial and funny, or is it serious? This entry was posted in Food. Tagged food, health. Heh. You know what I think about being ignored! Those dishes look especially tasty. Welcome home, Charlie! Hi Marian, Thank you for the helpful information, I just wanted to ask if all fruits are ok after the surgery like bananas and pomegranate ? Raj would love to share..Can No More Bear the Sight of Clipped Nails? Acquire these Tips! I’m not really qualified to tell you that, Raj. You’d better ask a doctor. Here is a site that lists foods that can cause bloating and gas, which you should avoid after gallbladder surgery: http://www.puristat.com/bloating/foods-that-cause-bloating.aspx.